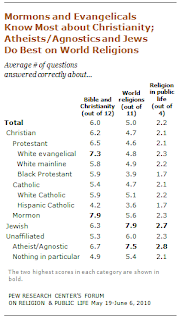 After seeing numerous articles discussing how atheists and agnostics typically know more about the bible then your everyday Christian, and considering my recent articles discussing fanatics like Christine O'Donnell who is running for Senate, I have found out that the Pew Forum on Religion and Public Life offered an online version of their quiz that they used to determine their results - they rephrase 15 of the 32 questions from the original telephone survey. I had decided to see just where I stand and while I did not score a perfect 15, I came pretty close - I got a 14! I was pretty satisfied with my score and was really surprised to see the percentage of people who got certain questions wrong that I thought was common knowledge. I had always thought the Jewish Sabbath was on Saturday, but according to Wikipedia it is from sunset on Friday to sunset on Saturday (maybe I should get a half-point for my answer). 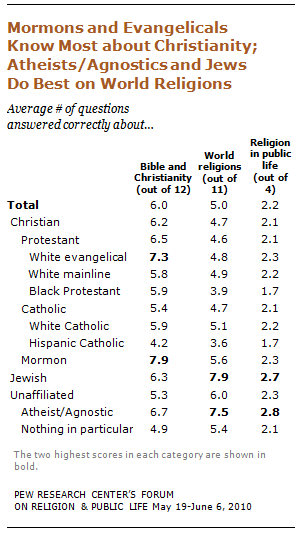 Here are two questions that I found of particular interest - the numbers on the right show how I compare to other religions (White Evangelical Protestant, White Mainline Protestent, Black Protestant, White Catholic, Hispanic Catholic, Mormon, Jewish, Atheist/Agnostic, and Nothing in particular). 10. According to rulings by the U.S. Supreme Court, is a public school teacher permitted to lead a class in prayer, or not? 11. According to rulings by the U.S. Supreme Court, is a public school teacher permitted to read from the Bible as an example of literature, or not? While most groups answered Question Ten correctly, most groups got Question 11 wrong - agnostics, atheists, and Jews got the highest scores. I find these results interesting because of comments you see from conservative Christian Americans, much like the ones you see on Andrew Breitbart's bevy of Big sites, who constantly fear that the Obama administration is trying to remove God from the classroom. The bible is permitted in our public schools for educational purposes but just so long as the contents in their religious context are not being taught to our nation's school children. I think it is important for Americans to become acquainted with all religions and not just their own, but more importantly, I believe they should remember the founding principles of this nation and not the revisionist history propagated by the far right. Check how you score here.